Zion United Church is located 12 Km. north east of Marmora. It was built in 1884 and became the social and spiritual center of a farming community. While many churches are located in larger communities, Zion is the community and fulfills a very important role in this rural area. Many of Zion's members are descendents of the founders and builders of the church. Those who leave the area maintain strong ties with the church community, often returning to participate in fund raising and special services such as baptisms and anniversaries. Although the population is small, the desire to support the church is large. 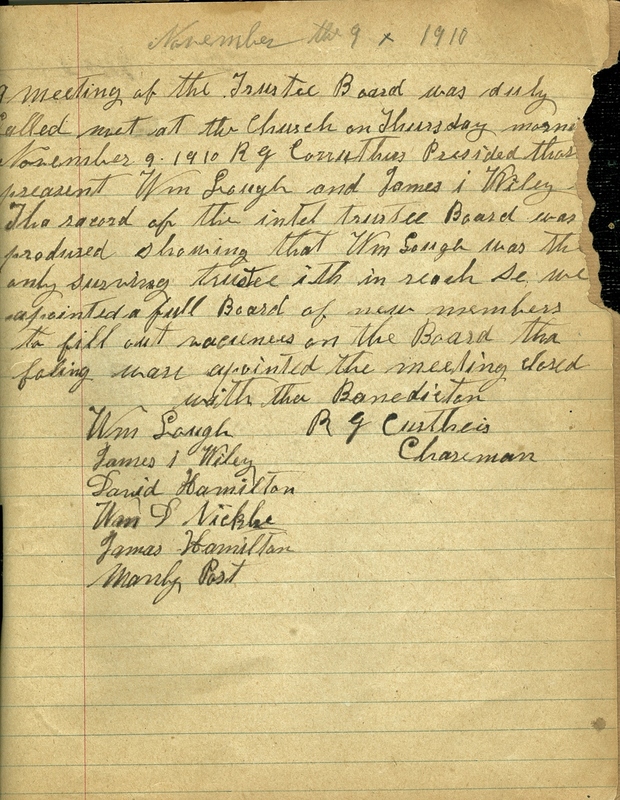 Minutes in 1910 appointing new board, Wm Lough being the sole member left. Dianne Sedore My husband's great grandfather built this little church (Arthur Tompkins). All of his family is there, Tompkins, Broads, McCoys. Sonja Ellis It has a dignity about it. When we buried my sister The birds were singing so beautiful . I felt a since of peace surround us.